The room 17 of the Uffizi Gallery is called Stanzino delle Matematiche (Little room of Mathematics). It is a small room adjoining the Tribuna. It was born from an idea of ​​the Grand Duke Ferdinando I de \'Medici, in the last years of the Sixteenth century. In this small Uffizi room, Ferdinand put his collection of scientific instruments, that his father, Grand Duke Cosimo I had started to collect. He imagined a \"room to set up for the study of military architecture\". Between 1599 and 1600, Giulio Parigi (1571-1635) painted the ceiling with a grotesque decoration. Some feats of the Medici family and the traditional Florentine professions are represented in the frescoes, but there is also a wonderful visual history of mathematics, as the military art foundation. 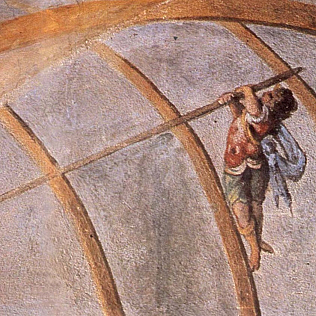 Pythagoras, Ptolemy, Euclid and above all Archimedes represented and celebrated in the frescos. We must remember that the Stanzino was built in the period of the scientific revolution, when these great men of the past aroused a new and deep interest. In the decoration it is also represented a part of the collection, but also some important ancient and modern inventions. The Little room of Mathematics is - along with others - a characteristic and particular space, which helps to make the Uffizi Gallery unique.